After many days of long hours at work, I've finally completed my BoomCo Colossal Blitz and tested it out. 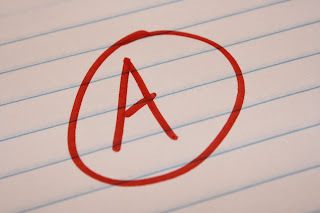 And it's amazing! While the blaster is enjoyable in its stock form, it really shines when modded. In stock form, the BCCB can hit 70' at an angle, but only in single fire. 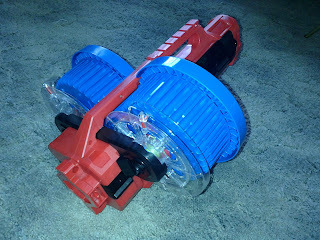 Full auto mode connects the pusher motor to the geared ammo drums, and the power required to turn them saps current away from the main flywheels. If you care to review the inner workings of the blaster, you can see my previous post on the BCCB. 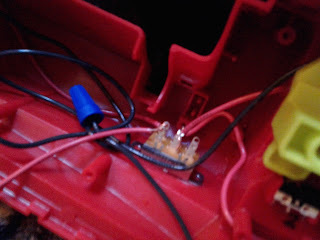 To start things off, I went through the entire blaster to remove all the wiring, as well as the safety switches, the flywheel motors' circuit boards, and the circuit board "hub" that all the switches and motors used to plug into. I then rewired with 18G copper wire. 16G would be better, but I had a ton of wire harvested from the old fluorescent light fixtures I replaced at work. Free is free, after all! 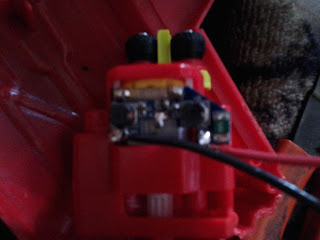 Here you can see the new wire soldered onto the motor terminals. 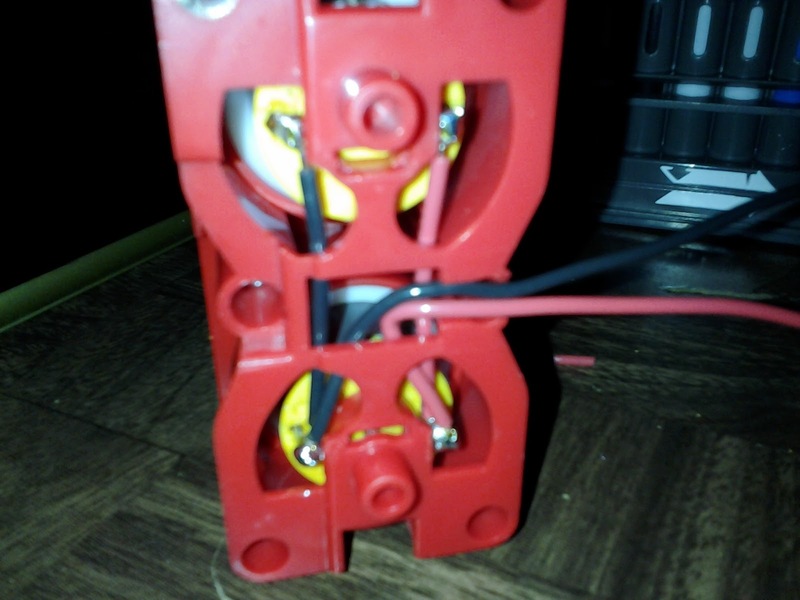 Note that the wire MUST be contained within the housing, and must exit via the middle groove in the front. There isn't any room in the shell to place those wires anywhere else. Here are the two new batteries I used! 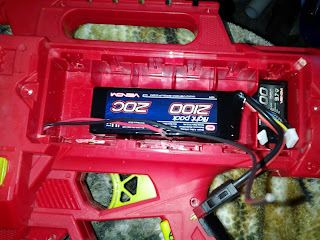 One is a 3S Lipo battery, the other is a 1S. They are dedicated solely to their respective circuits (flywheels and feeder motor). This requires removing the ridges within the battery tray - which are unnecessary if you aren't using "C" batteries, anyway. 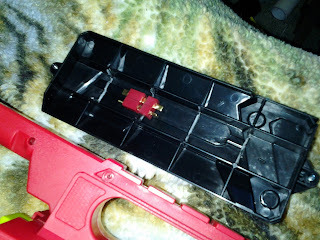 To make room for the wires and connectors to fit (I used Deans plugs), I took out the middle ridges in the battery cover. 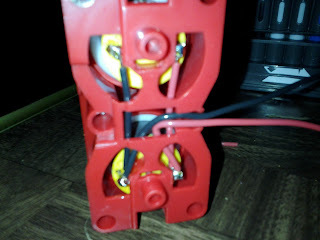 I didn't bother removing the board from the feeder motor. While spitting out an endless stream of darts might seem fun, this blaster already has a high rate of fire. No need to do anything special aside from soldering on the new wires. Finally, I added an extra switch as a manual safety of sorts. It's a heavy duty DPDT switch, and each circuit within the blaster is on one of the poles of the switch. Push the switch forward, and you're ready to do some damage! Here's the video showing the range tests, as well as an overview of the blaster. With these mods, I was hitting 70' ranges, firing level, in full auto. Firing at an angle, the BCCB becomes a handheld piece of dart-firing artillery, with tight groupings at 120'-130', and beyond if you're on a full charge. In stock form, the Boomco Colossal Blitz is a joy to use, even if the $90 asking price is too much. Luckily, Target has these on sale for $60 for the foreseeable future, so that issue is irrelevant for now. When modded, though, the BCCB really shines. 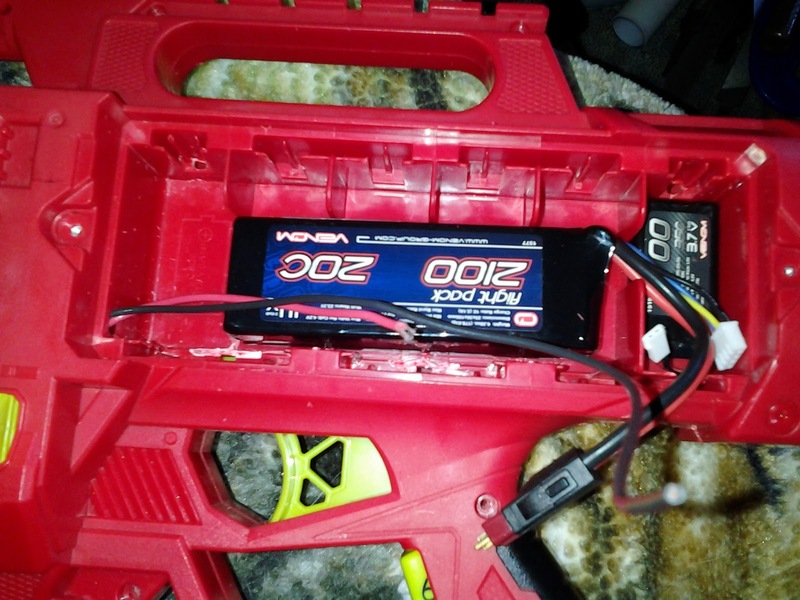 How difficult was this electrical mod compared to a similar rewire/re power on a flywheel nerf gun? They are all out of stock in the Target stores around my area. Dude can i pay you to mod mine?